Sheet-swap tiered skirt, originally uploaded by pennylrichardsca. 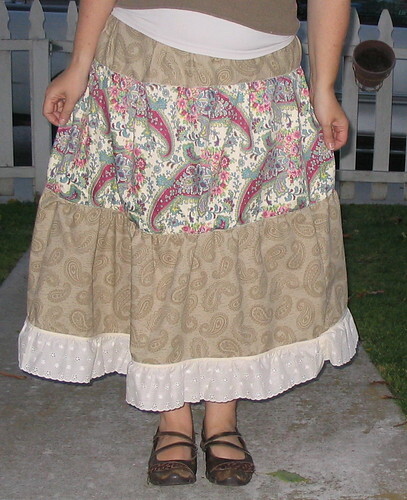 I’ve been trying to learn to sew clothes lately–nothing complicated–the skirt above is my first attempt at a tiered skirt, for example. It’s not great work, but it’s wearable. In doing this, I’m realizing that maybe it’s a good idea for someone who does women’s history to know a little about the work of constructing clothes, among other basic knowledge we could bring to our studies, but don’t always. Most of my projects have involved women who created things, not as artists, but as an expected part of their domestic lives. The antebellum North Carolina women in my dissertation often mentioned spending the week cutting out the next season’s clothes, and sent each other patterns and sketches. Mary Austin was proud of her cooking skills, enough that she gladly gave her enchiladas recipe to a women’s magazine in the 1920s, and her cookbook (among her papers at the Huntington) is still powerfully scented with vanilla. Opening that box is like walking into a bakery–the whole reading room turned to see who brought a fresh cake into the room. (When she was pregnant, she paid her rent by baking pies for the boardinghouse.) Celia Thaxter was famous for her garden, which somehow thrived even on the rocky island where she lived. Marion Brown in my current work was a prodigious knitter (according to her letters), and a dressmaker (or so they told the census). So, by learning to do needlework or sew or cook or garden, maybe we can better grasp what rhythms and pains and talents their work involved, as physical, sensory, intellectual acts? Yeah, I think so. Maybe even pick up on some subtle references and metaphors in their writing. Learning to sew to understand a past seamstress a little better is like learning a language or an industrial process or a set of laws or other elements of her everyday life–except that learning a language is something you can put on your CV, and learning to sew, well…. not so much. This entry was posted on May 31, 2008 at 2:06 pm and is filed under Uncategorized. You can follow any responses to this entry through the RSS 2.0 feed. You can leave a response, or trackback from your own site. This post made me think of a musical called “Quilters” that I saw last week. The story is woven together by pioneer women recounting bits of their lives, each story accompanied by one of 14 quilt blocks; in the final scene, a giant quilt unrolls which contains all the blocks. Your current train of thought about the importance of sewing (physically and metaphorically) fits right in with that show.